Annette's Creative Journey: Avonlea Bracket Frame & Blog Candy! I'm so excited to have hit the 500 follower mark! Thank you all for visiting and following along on my creative journey. It means the world to me that I might inspire just a few of you out there. Your comments are what motivate me and keep me going. As my thank you to you, I'd love to give away some goodies. All you have to do is leave a comment on this post, then on Monday, October 8th I'll post a winner or two of some great prizes! Be sure to come back on Monday to see if you were randomly selected. In the meantime, I wanted to share with you a creation I've made with the new My Creations Bracket Frame from Close to my Heart. It's starts as a plain white chipboard frame like this. It measures 11 inches at the outermost point and 7 inches inside, and 1 inch deep to create a shadow box frame. This is my creation using the bracket frame, the beautiful Avonlea papers, Antique Gold Assortment, Colonial White waxy flax, and Artiste & Art Philosophy Cricut cartridge cuts. I'm offering this as a workshop or as a take-home kit. and kits will ship on the 29th. Cost is $25 (plus shipping where applicable). I will PayPal invoice you once shipping has been calculated for your zip code. To complete the project, you will need a strong tacky glue, glue stick, and Chocolate stamp pad with dauber for ink distressing. Kits come with photos and instructions for assembly. You will receive pre-cut papers, Antique Gold Assortment pack, Colonial White Waxy Flax, and hardware to hang the frame. Now don't forget to leave me your comment so I can put you in the drawing! Wow! Congratulations on a great milestone! And I'm loving the new blog look too! Thanks for the chance to win some goodies! love your blog, your ideas always inspire me :) Congrats on 500 followers! Love the design of your bracket frame, what are you using for hardware to hang the frame....I'm looking for other options! Thanks! 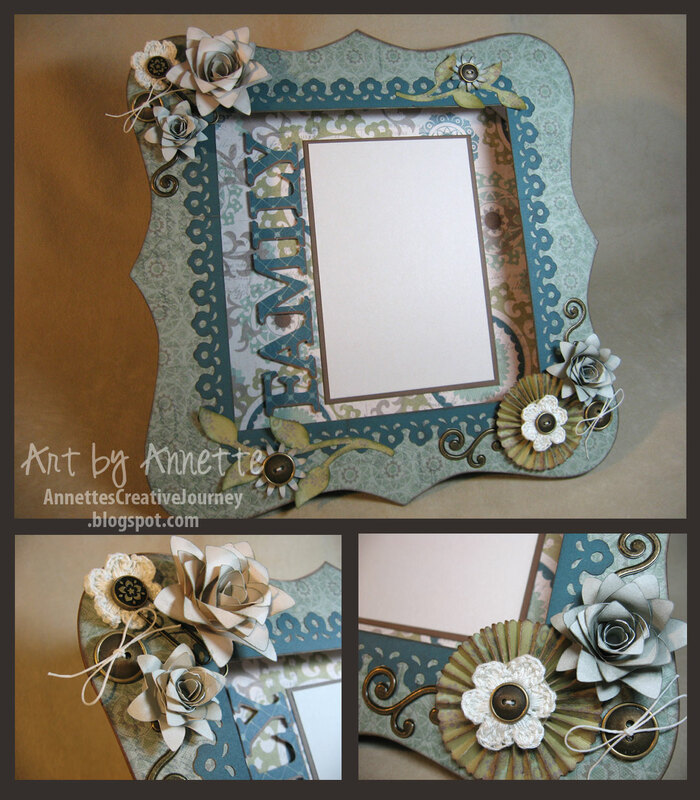 What a beautiful frame.... my favorite so far that I've seen done with Avonlea! I'm a big fan of your work... it's always inspiring and so pretty!... Oh, and congrats on the BIG 500! Beautiful, Annette! and WOW! Congrats on the 500 mark!! Wow, that turned out really gorgeous! I can never make things quite that nice! but I am trying to learn and visiting blogs like this really help me get my creative juices flowing! Thanks! Congratulations on your achievement - I love your project - so vibrant!! GORGEOUS Annette and Congratulations on that amazing mark! Your work always inspires me--as does this beautiful bracket frame! Congratulations on hitting 500 followers! Gorgeous frame! Your work is always amazing. Congratulations on your 500 followers! Congrats on the 500! Love your Avonlea frame, it is beautiful! Congrats on getting 500 followers! Thanks for the chance to win the blog candy! I can't thank you enough for sharing your beautiful artwork! I love to look at your blog! Your work is so beautiful and very awe inspiring work! Thanks for the chance. I LOVE your Avonlea frame! Your work is always so inspiring. Gorgeous! - from one your Flamingo "chicks" ~Debbie! Such a beautiful frame...Congratulations on 500!!! Everything you do rocks! I love this one, and congrats on the 500 followers....guess I will think about a blog! Ha!